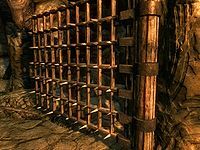 During your travels in Skyrim, you will encounter a variety of traps and physical hazards. Most traps are activated by a specific "trigger", which may be a physical object or an invisible proximity trigger built into the game. Several puzzles are trapped if you fail to solve them correctly. Traps often blend into their environment or may be hidden inside walls or other features, making them difficult to spot and avoid. With experience, most traps can be avoided altogether, or even turned against your enemies. Triggers are distinct objects that may activate traps or other devices, such as doors or gates, through direct physical contact or manual activation. Trigger activation is not limited to player characters, which means that followers, NPCs, and sometimes creatures can interact with a trigger device. 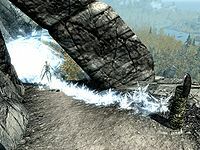 Some triggers can be activated at a distance by firing an arrow or a Magelight spell at them. 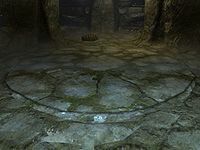 Description: Look for small inset plaques; buttons in Dwarven ruins are usually set in ornate pedestals and have a small blue orb. Effect: Pressing the button will activate its associated object, which may be a door or a trap. Notes: Some buttons can be activated multiple times, allowing the associated doors to open and close or causing traps to re-fire. Buttons may open and close doors or gates, or may trigger a nearby trap. 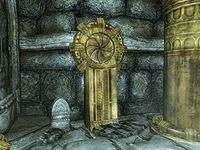 They are sometimes used in puzzles (like the one used to activate the Oculory in the Tower of Mzark during Elder Knowledge), where they usually must be activated in a specific order to complete the puzzle. The button closest to a closed door may activate a trap instead of opening the door as expected (in these cases, the correct button is usually located elsewhere in the room or around a corner). Some buttons may be hidden or found locked behind a barrier, which must be unlocked before they can be activated. Followers can be instructed to activate switches, including buttons. Description: These handles, found on pedestals or set in carved figures on walls, will pull out and rotate when activated. Effect: Turning the handle will activate its associated object, which may be a door or a trap. Notes: Some handles can be activated multiple times, allowing the associated doors to open and close or causing traps to re-fire. Handles are usually used to open gates or hidden doors, but may also be used to activate or disables traps. Handles may sometimes appear as an element of a puzzle, such as the totem puzzle in Volskygge during its related quest. The handle closest to a closed gate may activate a trap instead of opening the gate as expected (in these cases, the correct button is usually located elsewhere in the room or around a corner), and you may need to activate multiple handles in order to successfully open a gate. Handles may be hidden or found locked behind a barrier, which must be unlocked before they can be activated. Followers can be instructed to activate switches, including handles. Description: Levers have a wooden or metal handle in a rounded metal base, usually mounted on floors or walls. 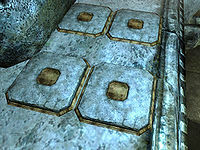 Levers appear in plain, Nordic, and Dwemer styles, but their functionality is always the same. Effect: Pulling the lever will activate its associated object, which may be a door or a trap. Notes: Some levers can be activated multiple times, allowing the associated doors to open and close or causing traps to re-fire. Levers are commonly used to open doors, gates, or grates, but may also be used to deactivate a trap. When used as a puzzle element, levers usually must be activated in the correct order to solve the puzzle; activating the levers in the incorrect order may trigger a trap, such as a barrage of darts. 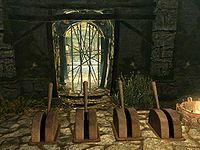 You may also be required to throw a lever after solving another puzzle (such as a series of rune totems) in order to open a door, like one found in Bleak Falls Barrow during its related quest. The lever closest to a closed door may activate a trap instead of opening the door as expected (in these cases, the correct lever is usually located elsewhere in the room or around a corner). Some levers may also be hidden or found locked in small wall-mounted cages, which must be unlocked before they can be activated. Followers can be instructed to activate switches, including levers. 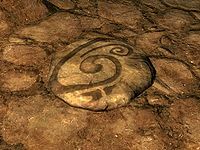 Description: Pressure plates may look like a circular metal plate, a round stone with a Nordic symbol, a plain raised stone, or a square Dwemer floor tile. A noticeable clacking sound can be heard when the plate is triggered. Effect: When enough weight is applied to the plate, the associated trap will activate. Firing an arrow at the plate will also activate the trigger. Notes: After the weight is removed, the trigger will reset, allowing its associated trap to trigger again. Pressure plates are used to trigger a variety of traps, including battering rams, spike walls, and darts. They are sometimes used as an element in puzzles. Although pressure plates cannot be disarmed, they are most often placed in the center of a hallway or passage, and activation can often be avoided by hugging the walls or simply jumping over the trigger surface. You can also place a heavy object, such as a body, on the plate; the trap will be triggered, but the weight of the object on the plate will prevent the trap from firing again. The sneak perk Light Foot will allow you to walk and run directly over pressure plates without activating them, even when in werewolf form. Description: A pull chain is a wall-mounted switch that consists of a length of chain with a ring attached to the end. Pull chains appear in plain, Nordic, and Falmer styles, but their functionality is always the same. Effect: Pulling the chain will activate its associated object, which may be a door or a trap. Notes: Some pull chains can be activated multiple times, allowing the associated doors to open and close or causing traps to re-fire. Pull chains are most commonly used to open gates or doors or to disable traps. You may have to activate two or more pull chains in order to open a particular barrier. 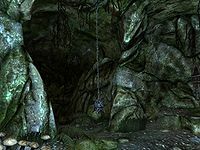 Pull chains may also be used as an element in puzzles, such as the third test in the Twilight Sepulcher during Darkness Returns. The pull chain closest to a closed door may activate a trap or a different door instead of opening the door you expected (in these cases, the correct button is usually located elsewhere in the room or around a corner). 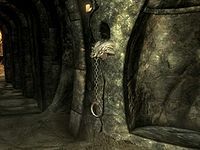 Pull chains can blend into dark dungeon walls, making them difficult to spot. They may also be hidden or found locked behind a barrier, which must be unlocked before they can be activated. Followers can be instructed to activate switches, including pull chains. Description: Look for a small box mechanism attached to a door or chest with a cable connecting to a nearby pin. A snapping sound is heard when the cable breaks. Effect: When the door or chest or opened, the cable snaps, triggering the associated trap. Notes: Tension cables lose their functionality after they have been broken. They can be disabled with a lockpick. 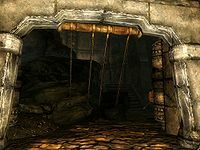 Tension cables are typically attached to locked doors or chests, set to trigger traps such as darts when the container is opened by an unsuspecting adventurer. While the mechanism attached to the cable is sometimes in plain view, it is advisable to check both sides of a container before attempting to open it. If you do not have any lockpicks or choose not to disarm the cable, you can usually avoid any damage by simply by analyzing the trap and dodging it after intentionally triggering it. Arrows or spells aimed at the tension cable can do this from a safe distance—preferably somewhere near a corner, doorway, or solid object you can use for cover from projectile traps. Description: You will see a cord stretched across an area of floor a few inches above the ground, often secured to wooden stakes. A snapping sound is heard when the wire breaks. Effect: Passing through the wire causes the cord to snap, activating the associated trap. Notes: Tripwires lose their functionality after they have been broken. Because tripwires can only work once, they most commonly trigger single use traps like falling rocks, swinging maces, and battering rams. You can avoid the trap by jumping over the cord. You can also break the wire manually with the activate button, or by shooting at the wire with an arrow or spell. Description: Valves are operated with a large red wheel that utilizes steam energy to activate a trap. Effect: When the wheel is turned, the associated object is activated. Notes: Valves usually reset, but may be a one-time use depending upon the associated object. 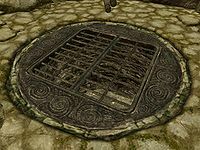 These Dwemer mechanisms utilize steam energy to keep a trap ready until it is needed; when the valve is opened, the steam pressure releases the trap on the unsuspecting victim. Valves can also be used to operate doors or gates. 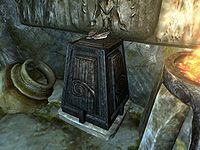 Description: Look for pedestal topped with a weight-sensitive slab, usually bearing a desirable object such as a potion or a piece of equipment. Effect: When the item is removed, the trap is triggered. Notes: The plate will only activate once and cannot be disabled. You can use the Alteration spell Telekinesis to remove items from weight sensitive plates from a safe distance or angle. Items can also be knocked free with arrows or spells, but may be more difficult to find after they have fallen. The Slow Time shout can also be used to quickly snag the item and run away before the harmful effects of the trap are triggered. It is also possible to switch the object on the plate with an item from your inventory if you wish to avoid activating the trap at all. These traps deal physical damage and may forcibly move the victim on impact. With the right timing, many of these traps can be successfully used against nearby enemies. Description: These large, Nordic-carved logs are mounted to the ceiling with a bracket. Effect: When triggered, the log swings down and forward, causing physical damage and pushing its target backward. Notes: Battering rams may reset or may only fire once, depending on the triggering mechanism. The majority of battering rams are activated by trigger mechanisms such as pressure plates or tripwires placed in the middle of a passage, and are designed to strike an area slightly ahead of the trigger (intended to catch you as you run past the trigger). Battering rams attached to chains will only deploy once, while those attached to metal frames reset after a few seconds. Watch the floor for possible triggers and the ceiling for any rigged logs in order to avoid this trap. If you accidentally trigger a battering ram, back up quickly to avoid being struck by the heavy log. Since battering rams strike a fairly small area, it is possible to sidestep the ram as you continue moving forward, but this feature also makes it more difficult to use a ram against enemies. Description: Look for a metal jaw trap placed on the ground. Effect: The trap will snap shut when stepped on, causing damage. Bear traps have a 2.5% chance of infecting you with a disease. Notes: Bear traps will not reset automatically, but can be reset or disabled with manual activation. Generally more of a nuisance than a serious threat, bear traps can be disarmed ahead of time by manual activation,. You can also reactivate them to slow enemy pursuit. The Sneak perk Light Foot will allow you to walk and run directly over bear traps without activating them. There is a very small chance that you will contract Ataxia, Bone Break Fever, Brain Rot, Rattles, Rockjoint, or Witbane from bear traps. You can also manually move bear traps by dragging them, in order to place them on more tactical locations. Description: You will see bones on rope hanging from the ceiling or strung horizontally between two posts. The bones will rattle when touched. Effect: Physical contact generates noise detectable by enemy NPCs. Notes: This trap will always remain active and cannot be disabled. While bone chimes do not cause any physical harm to the player, accidental activation will cause a sound detection event, alerting nearby enemies to your presence and potentially ruining the chance for a sneak attack. 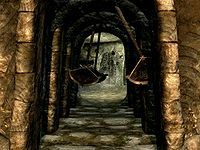 The jangling chimes may wake sleeping NPCs or undead. Description: Look for a large, three-fingered claw made of chaurus chitin, attached to a wall, floor, or ceiling. The trap makes a noticeable clunking noise when activated. Effect: When activated, the claw releases, sweeping quickly forward or downward to strike you. Anyone hit by the claw will be damaged and has a 5% chance of contracting a disease. Notes: After the claw has released, it will usually retract to its original position. Claw traps are often triggered by tripwires, so although they may retract as if to strike again, traps connected to tripwires will not be able to activate a second time. While it is not possible to directly disarm a claw trap, you may be able to disable the mechanism that triggers it. Depending on how they are placed, claw traps can usually be easily spotted and avoided. You may also be able to trigger them remotely (by striking the trigger with an arrow or spell). There is a very small chance that you will contract Ataxia, Bone Break Fever, Brain Rot, Rattles, Rockjoint, or Witbane from claw traps. Description: You will see a slightly raised rounded area of floor. If you look up, you will see rusty spikes on the ceiling. Effect: When an actor stands on the rounded area, the disk shoots up towards the ceiling and anyone standing on it may be impaled by the spikes. Notes: This trap resets after the disk has lowered back to the floor; it will always remain active and cannot be disabled. Being slammed into these spikes can cause significant damage, so it is best to scan the floor carefully as you go and avoid any suspect areas. If you find yourself rocketing towards the ceiling, immediately run off the side of the moving platform to avoid the spikes. Description: These large, brownish-grey sacs are usually found in groups of two or more. A squelching noise can be heard when the cocoon bursts. 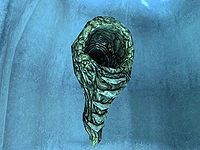 Effect: When approached, the cocoons may burst, releasing a chaurus hunter or a chaurus hunter fledgling. Notes: The cocoon will only open once and cannot be disabled. 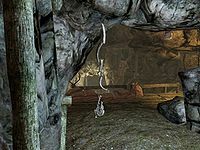 Chaurus cocoons can be found in Falmer-infested locations added by the Dawnguard add-on. They may be inert, or a chaurus may burst forth when you come near them. They can be destroyed by weapons or spells, but may still release their occupant if the first attack does not destroy them. Description: You will see up to three crossbows aimed at specific location. Effect: When activated, the crossbows will fire a barrage of bolts into a kill zone, causing damage to any creature struck. Notes: The crossbows are triggered by a tripwire and will only fire once. 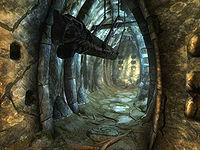 Crossbow traps are added by the Dawnguard add-on. They can be avoided by evading the trigger, and you may be able to disable the trigger or set it off remotely with a spell or arrow. Activate the crossbow mount itself to receive a crossbow; if the trap has not fired, you will receive a bolt as well. If you activate the mount again, you will re-insert the crossbow, load a bolt from your inventory, and reset the trap. Description: Look for a set of small tubes set in a wall, floor, or ceiling. Some dart traps may not be visible. Effect: When activated, a rapid volley of darts is fired into a target area, causing physical damage, poison damage, or disease. 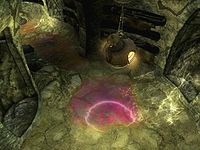 A Dwemer variety of dart causes slightly more damage than the generic variety. Notes: Dart traps may reset or may only fire once, depending on the triggering mechanism. 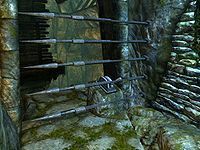 One of the most common traps encountered in ruins, dart traps have a wide variety of triggers, including pressure plates, levers, and tripwires. If the trigger that activates the darts can be disabled (like a tripwire), disabling the trigger will disarm the darts. As with other traps, you may also be able to set off the trap remotely with a spell or arrow. If you have been caught in a dart trap, it is best to move quickly out of firing range, as the combined damage of multiple darts and their poison or disease effects can be quite deadly. Description: You will see a gold metal fixture on the wall with a round opening. A soft, steam-like sound can be heard when it opens. 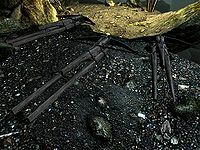 Effect: When you pass near the scuttle, the gate will open to release a Dwarven spider or sphere. Notes: The scuttle holds only one enemy. This trap cannot be disabled. 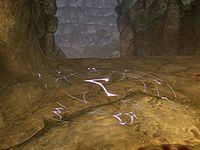 Dwarven scuttles are a common element in Dwarven ruins. Most are inert, but a few will release an automaton when approached. There is no visible trigger for them, and sneaking will not prevent them from opening. The Aura Whisper shout will help you detect the automaton while it is still in the scuttle. Description: The ballista looks like a large, formidable crossbow mounted on a stand. Effect: When triggered, the ballista will fire three missiles straight ahead, resulting in physical damage. Notes: The Dwemer ballista will only fire once. 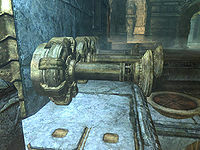 One of the deadliest devices in Skyrim, Dwemer ballistae are usually found as one-time-use launchers in Dwarven ruins, activated by a nearby lever. The only reported instance of this item being used as a trap is within the depths of Raldbthar. It is triggered by a pressure plate across from the ballista at the top of a flight of stairs. It can be avoided by simply running over the trigger and down the stairs, causing the missiles to pass harmlessly overhead. 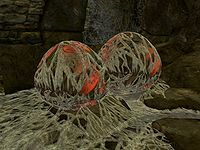 Description: These pulsing, slime-covered egg sacs have a distinct colored glow, and make a squelching noise when burst. Effect: When approached, a spider will burst forth from the sac and attack. Notes: The eggs will only burst once and will not reset. Found only in Solstheim, these curious egg sacs contain magical flame and frost spiders. The glow of the egg corresponds to the particular type of spider inside (red for fire and icy blue for frost). The eggs can be triggered from a distance if struck by a missile or spell, and you can avoid them altogether if you have sufficient Sneak skill. Although poison and shock spider egg traps exist in the game data, they are only ever used in a test cell and do not appear in-game. Description: Several boulders are held in a wooden container mounted overhead. Traits: When triggered, the gate drops and the rocks tumble out, causing damage to any creature struck. Large rocks cause twice as much damage as small rocks. Notes: The boulders will only be released once, but they will remain on the ground and can hinder your passage. Falling boulders are most frequently triggered by tripwires, although some (such as the boulder traps at Robber's Gorge) are triggered by levers or other switches. Description: Look for a dull-colored, fungus-like tunnel attached to the wall. 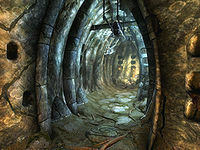 Traits: When approached, a Falmer will come through the tunnel. Notes: The pod holds only one enemy. This trap cannot be disabled. 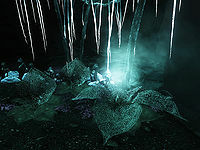 Falmer pods are a common element wherever Falmer enemies are found, including some Dwarven ruins. Most are inert, but some house lurking Falmer that will emerge when the pod is approached. Sneaking will not prevent the Falmer from exiting the pod. A Detect Life spell or the Aura Whisper shout will help you detect the Falmer while it is still in the pod. Description: What appears to be an ordinary statue is actually a gargoyle in disguise. 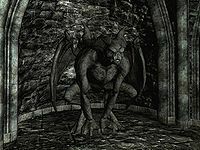 Effect: When approached, the gargoyle will come alive and attack. Notes: Once the gargoyle has transformed, it will not return to statue form. This trap cannot be disabled. Gargoyle statues are typically used as a decorative element in certain areas and are seen in groups (with one flanking each side of a room, for example); usually, only one or two of the statues in a particular area are actually gargoyles. You may be able to distinguish disguised gargoyles from ordinary statues with the use of spells such as Detect Life or Soul Trap. Gargoyles in statue form are immune to damage and cannot be attacked until they have transformed. Description: Watch out for a dangling chain of sharp bones. Running into the bones creates a noticeable sound. Effect: Touching the bones results in physical damage and a 40% chance of disease infection. Like bone chimes, strings of infected bones are used as alarms to alert nearby enemies of your presence. The noise caused by coming into contact with the bones may ruin your attempts to sneak past enemies, or may wake sleeping NPCs. Since this particular alarm also inflicts damage, it is best to walk carefully around them whenever possible. Infected bones are particularly nasty traps when it comes to disease, and have a fairly high chance of infecting you with Ataxia, Bone Break Fever, Brain Rot, Rattles, Rockjoint, Sanguinare Vampiris, or Witbane. 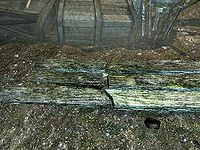 Description: Look for a series of wooden planks on the ground, partially covered by dirt. Effect: When an actor walks over or stands on the planks, the rotted wood breaks, causing the victim to fall. Creatures who fall into this trap may take falling damage, depending how far they fall. Notes: The plank will remain damaged, forcing you to maneuver around the exposed pit. You may be able to tell a rotted plank from a solid one by checking any wood planks on the floor for cracks. If you see a crack in the plank, it is probably best to go around that area, or jump over it if possible. Description: These ordinary-looking barrels are found in areas where Rieklings reside, and are indistinguishable from normal barrels. A loud cracking noise is heard when the barrel breaks. Effect: When you pass close to the barrel, the Riekling inside will break free. Notes: The barrel is destroyed when the Riekling escapes. This trap cannot be disabled. 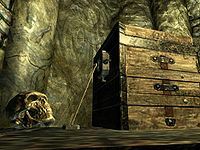 Barrels containing Rieklings look identical to ordinary barrels, so be on your guard when looting barrels in any areas that are inhabited by Rieklings. Description: An enormous mammoth skull is hung from the ceiling by thick ropes. A distinctive clunking sound is heard when the skull is released. Effect: When triggered, the skull swings forward, causing devastating physical damage and shoving victims backward. Notes: Skull rams will fire only once. Like battering rams, skull rams are activated by trigger mechanisms such as pressure plates or tripwires placed in the middle of a passage. The mammoth skulls used in these traps are far more deadly than the logs used for battering rams, even at low levels, and the impact of the swinging skull can throw you a huge distance backward. Watch the floor for possible triggers and the ceiling for any looming skulls in order to avoid this trap. If you accidentally trigger a skull ram, retreat immediately to avoid its massive tusks. Skull rams sweep over a much wider area than ordinary battering rams, and can be used against your enemies with devastating effect. 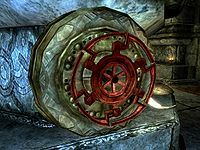 Description: This Dwemer device consists of a series of blades mounted above a doorway or on a wall. Effect: When activated, the blades swing on a hinge to slice unwary adventurers. Notes: Slicers will typically reset and can be re-triggered. 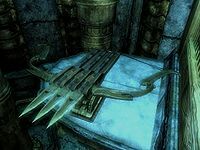 The Dwemer slicer operates like the spike wall and the claw trap; depending where it is placed, it will swing toward you from the side of a wall or down from the ceiling, and is often triggered by pressure plates and tripwires. You cannot disable the slicer directly, but you may be able to disable or avoid the mechanism that triggers it. 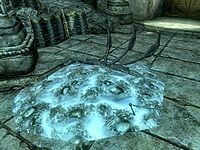 These traps are some of the most deadly found in Skyrim, so it is best to avoid triggering them at all, or get quickly out of the way if you (or your follower or another creature) happen to set it off. Many enemies will not be able to move quickly enough to avoid the sweeping blades once they have been activating, so it is fairly easy to use these against hostile NPCs or other creatures. Description: Look for a row of small holes in the wall, floor, or ceiling. The spears make a distinctive, metallic sound when activated. 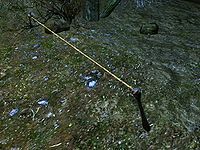 There are three varieties of spear (generic, Dwemer, and Falmer), each with a different appearance and slightly different effects. Effect: When triggered, spears will lance out of the wall, then retract. Anyone struck by the spears will take damage, and the spears obstruct passage until they retract. 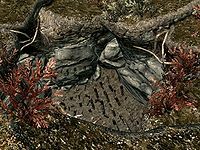 The Falmer variety of spear has a 2.5% chance to cause disease. Notes: Spear traps may reset, depending on the trigger that activates them. 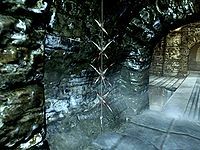 Spear traps are commonly located near trapped chests or doors and are often triggered by a tension cable. Some may also be rigged to pressure plates or other trapped switches. 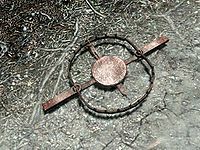 When you hear a spear trap spring into action, you should make a point of quickly getting out of the way, as they can cause significant damage. 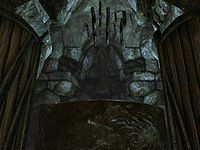 Ceiling-mounted variants are found in some Dwarven ruins, and are easily spotted by the presence of pressure plates. 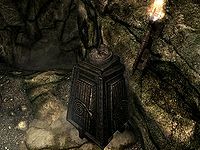 Generic spike traps have a hexagonal hole, while Dwarven spike traps are more rectangular. 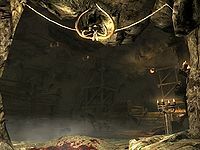 The Dwemer variety of spear does the most damage, while the Falmer variety has a very small chance to infect you with Ataxia, Bone Break Fever, Brain Rot, Rattles, Rockjoint, or Witbane. Description: You will see sharpened wooden stakes, usually placed at the bottom of a pit or on the edge of a precipice. Effect: Falling into the pit will result in physical damage from the spikes. When progressing through wilderness areas, keep an eye out for any sudden changes in terrain, which may indicate the presence of pits. If you fall into a pit, escape as carefully as possible, as you may take more damage from the spikes if you bump into them while trying to jump out. 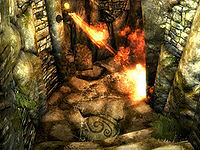 Description: Look for a large square metal grate with spikes on one side, attached to a hinge on a wall or ceiling. The gate makes a metallic clank when triggered. Effect: When triggered, the gate quickly swings down or around, then retracts to original position. Anyone struck by the gate will take damage and will be shoved back or slammed into a wall. Spike walls have a 1% chance of causing disease. Notes: Spike walls will typically reset and can be re-triggered. Spike walls are usually triggered by pressure plates located in the center of a hallway, so keeping a lookout for plates and hugging the walls in dungeons will help you avoid the majority of these traps. The Light Foot perk will allow you to avoid setting off any spike walls that are triggered by pressure plates. Spike walls found on high, narrow paths are particularly dangerous, as the force of the blow can knock you off the walkway. The high damage and knockback of spike walls can make them useful against enemies lured into the area of effect. Use caution with followers, as it can be difficult to get them to successfully follow you around the trigger. There is a very small chance that you will contract Ataxia, Bone Break Fever, Brain Rot, Rattles, Rockjoint, or Witbane from spike wall traps. 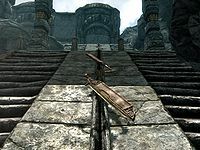 Description: The blades are hidden in a long channel, usually on a ramp in the center of a stairway. Another version of this trap is stationary and is hidden until activated. Traits: When triggered, blades will spring out of the channel, running end to end along the track until the trap resets. The stationary version runs until it is disabled. Spinning blade traps have a 1% chance of infecting you with a disease. Notes: This trap will reset, and can sometimes be deactivated by a nearby switch. Spinning blades are one of the deadliest traps in the game, capable of quickly killing anything that comes too close. The trap can be activated by a variety of triggers, and in some instances merely passing by will set it off. If you spot the blades' track before the trap activates, stay well away from it. As soon as you hear or see the blades moving, get clear of their reach as quickly as possible to avoid damage. There is a very small chance that you will contract Ataxia, Bone Break Fever, Brain Rot, Rattles, Rockjoint, or Witbane from spinning blade traps. Description: Look for a series of large round pistons on a wall. Effect: When triggered, the piston extends, pauses for a few seconds, then retracts. The piston will push anyone standing in its path. Notes: This trap resets after activating. 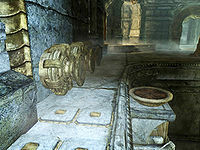 You will encounter several steam pistons in Dwarven ruins that are constantly active, while some are activated by triggers, such as a pressure plate. Pistons are often set on narrow ledges and will push you off the ledge or into another trap if you do not avoid them. The pistons block movement while extended. In a few cases, steam pistons will extend upward from the floor and can be used to reach higher ledges. Description: These large, pendulum-shaped blades are hidden in vertical channels along a hallway. After activation, swinging blades make loud, sweeping sounds with each swing. Effect: Once triggered, the blades will swing back and forth until deactivated, causing physical damage and a 2.5% chance of disease infection. Notes: This trap cannot be disarmed, but can typically be deactivated by a pull chain found past the blades. Swinging blades can be avoided by sprinting or using the Whirlwind Sprint shout. You can also pass one blade at a time, stopping in the gap between blades before moving past the next one. This can be difficult, however, as the space between blades is fairly narrow. You can also avoid damage by using the Become Ethereal shout and walking through. There is a very small chance that you will contract Ataxia, Bone Break Fever, Brain Rot, Rattles, Rockjoint, or Witbane from swinging blade traps. Description: Look for large, spiked metal balls suspended by chains that are attached to the ceiling. Effect: When triggered, the mace will be released, swinging downward. The mace causes physical damage to any creature it strikes. Notes: Although the mace will only be released once, it may still do damage if you run into it after it has been activated. Can be used manually by grabbing and swinging at enemy. Swinging mace traps are usually triggered by tripwires. Like any trap rigged to a wire, it will not be activated if the tripwire is disarmed first, and you can activate the trap from a safe distance using an arrow or a spell. You can avoid a descending mace by quickly running backwards or by moving off to the side as it swings by. Description: These slick black tentacles emerge from pools of oily black water in Apocrypha. Effect: The tentacles attack by lashing out with a whipping motion. Notes: There are two versions of this trap, one triggered by the player and one that activates automatically. 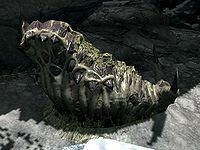 Tentacle traps are only found in Apocrypha, Hermaeus Mora's plane of Oblivion. Their whip attacks can deal a hefty blow to the unwary. There is a very small chance that you will contract Ataxia, Bone Break Fever, Brain Rot, Rattles, Rockjoint, or Witbane from tentacle traps. Description: You will see a large grating in the floor, set in an ornate metal disk. A metallic clank can be heard when the doors swing open. Effect: When triggered, the two doors swing open downward; if you are caught standing on them, you will fall through to the area below. Notes: This trap will always remain active, although some can be disabled by activating a nearby pull chain. Trap doors cannot be disarmed directly, but it is possible to avoid the trigger. Some trap doors are operated manually via a pull chain or other switch. If you fall through the doors, you will have to find your way through the dungeon back to the room with the trap. You may be able to move off of the trap door and avoid falling if you react quickly enough. These traps take on a variety of forms, but they all cause elemental or magical damage. The effects of magical traps can be resisted through racial powers, enchantments, and alchemy potions. Description: Pools of pitch blackness obscure the area before you. Effect: Walking into the dark areas will slowly drain your health. Notes: The darkness will always remain active and cannot be disabled, but can be avoided with the use of personal light sources. These areas of damaging darkness are found only in sections of Apocrypha that are accessed by reading the Black Books Filament and Filigree and The Sallow Regent. As you move through the darkness, if your location has 30% light or less, the trap will deal 1% of your total current health per second. If the area is brighter, the darkness will not damage you. The damage from this effect is scripted and cannot be resisted by any means (including the Become Ethereal shout). You can, however, use light effects (such as Candlelight, Magelight, and torches) to surround yourself in light and avoid the darkness effect. Description: Watch for a large, faintly glowing symbol on a wall or floor. Effect: Contact of any kind will trigger the rune, which unleashes a blast of elemental energy (fire, frost, or shock). Notes: The rune vanishes once triggered and cannot be disabled. The damage caused by runes can be deadly, depending on your level and any resistances or enchantments you may have, so it is best to steer clear of them whenever possible. Elemental runes can be triggered from a safe distance using a spell, shout, or arrow. You can also use the Whirlwind Sprint shout to run past the rune without taking damage from the blast. Description: Watch for slightly raised floor tiles with a dark rounded diamond design. Each tile has five small holes (one in the center and one in each corner). The tiles shift audibly when enough pressure is applied. Effect: When sufficient pressure is applied to the tiles, flames spout upward from the holes, causing fire damage to any creature touched by the fire. Notes: The flame spout will continue to fire as long as enough weight is applied. These traps usually appear in a large number, covering the majority of a room or passageway. 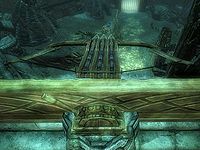 An arrow fired at one of the tiles provides enough force to trigger the trap, and placing an object (such as a corpse) on a tile will cause the trap to fire continuously. The Sneak perk Light Foot will allow you to walk and run directly over flame spout traps without activating them. Using Whirlwind Sprint to pass over the tiles will trigger them, but the burst of speed is fast enough evade the resulting flames. If the center of an individual plate lacks a dark diamond in the center, it will not shoot flames, even when stepped on. 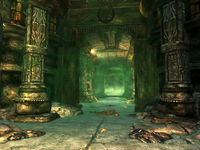 Description: Look for statues or ornate wall features that have a small tube. A whooshing sound is heard when the flames appear. Effect: When triggered, a jet of flame shoots out from the tube in the statue, causing fire damage to anything it touches. Notes: These traps may fire continuously or may deactivate after a brief time. Flamethrower statues are usually triggered by a switch, such as a pressure plate. The flamethrowers cannot be disabled directly, but avoiding or disabling their associated triggers will prevent them from firing. If you accidentally activate a flamethrower trap, rush quickly out of the path of the flames to avoid taking damage. Description: This gas appears as a mild visual distortion or shimmering effect in the air. Effect: The gas ignites when exposed to any flame, resulting in an instant flash-burn explosion that deals substantial fire damage. Notes: Although the gas will be consumed by the flames, it may be replenished after some time. Flammable gases are only found in a few places, but can be quite dangerous. 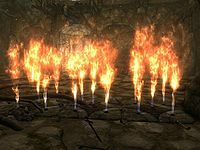 Any ignition source, such as a lit torch, Fire Breath shout, or even having a flame spell at the ready will ignite the vapors, causing significant damage to everyone caught in its area of effect. The resulting explosion will also alert nearby enemies. After exploding, the gas will take some time to build up to explosive levels again. Be very careful if you have a follower who is carrying a torch or likes to use fire spells. Setting off a gas explosion can cause your follower to become hostile to you if they are damaged by the fire, or can cause two followers to become hostile to each other if one of them sets it off and damages the other. 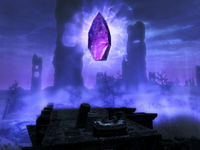 Description: These glowing purple crystals found floating above structures inside the Soul Cairn resemble large soul gems. Effect: When you approach the crystal, it will drain your health. A trail of purple light can be seen between yourself and the crystal while the drain is in effect. Notes: The crystals are always active and cannot be disabled. 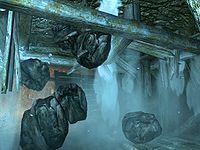 Ideal Master Crystals are large, floating crystals found in various locations within the Soul Cairn. When you pass within range of the crystal, its magic will drain 10 pts of health per second and damage health regeneration by 100%. The effects of the crystal's drain can be avoided by eating soul husks. If your health regeneration is higher than 100%, you will still regenerate health (although much more slowly) while under this effect. Description: Areas of bright light appear scattered throughout an extremely dark chamber. Effect: Walking into the light causes heavy damage, which can quickly kill you. Notes: The light will always remain active and cannot be disabled. Light traps are found only in the Twilight Sepulcher. The damage from the light is scripted, so there is no way to resist it (not even with the Become Ethereal shout). The light can cause significant damage regardless of your level—20% of your base health per second at max damage, or 5% if not—and is also affected by game difficulty, so be especially cautious if you are playing at higher difficulties. It is best to simply avoid the light in this area as much as possible. Description: You will see a shiny, iridescent pool of liquid on the floor. Often, small ceramic lanterns will be hanging over the pools. Effect: The oil pools are harmless unless ignited by a fire source. When lit, the oil catches fire and burns for several seconds, causing fire damage to anyone touched by the flames. Notes: The oil is burned away by the fire. Oil slicks and lanterns can be lit by a fire spell or Fire Breath shout, or by dropping a lit torch into the oil. Shooting the lanterns hanging over the oil will drop the lantern into the puddle and ignite it. These traps can also be triggered by enemies or even ignited by a secondary trap mechanism (such as a tripwire) that drops a lantern from the ceiling. 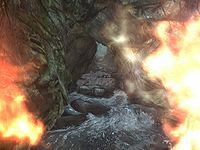 Note that the fiery trail left by flame atronachs will not ignite oil slicks, though the atronachs may still set them off inadvertently with their spells or by setting off trap mechanisms. Description: Look for large plants with lace-like petals closed into a bulb shape, often found in bunches of three or more flowers. Effect: When approached, the petals will open, releasing a puff of poisonous gas into a small area. Standing in the gas will cause poison damage. Notes: Poison blooms will only "bloom" the first time they are approached by you or an NPC, until the zone they are in resets. Poison bloom plants are somewhat abundant in Darkfall Passage. Their large size and distinctive appearance make them fairly easy to spot, and you can avoid the poison gas they emit by simply keeping your distance from the plants. Although each individual plant may not be particularly deadly, the combined effect of the gas from a cluster of several flowers can drain your health very rapidly, so approach them with caution. If you intend to harvest the poison bloom ingredient, you can either quickly approach the plant and harvest it before it fully opens, or trigger its bloom then back off, waiting until the poison gas has dissipated before collecting the ingredient. Description: This deadly gas fills an enclosed area with a green, smoke-like substance. Effect: Standing in the gas for any length of time results in continuous poison damage. Notes: The gas can be cleared by activating nearby vents, and can be dispelled with the Clear Skies shout. This trap is only found in Calcelmo's Laboratory. Standing in poison gas causes poison damage over time. Fortunately, there are vents located along the gas-filled passage, which are activated by their corresponding pressure plates. You can also use Clear Skies to dispel the gas. Description: These traps consist of a soul gem resting on a small carved pedestal. Effect: When a creature passes into the trap's range, the gem will begin to fire elemental spells targeting the creature (Chain Lightning, Fireball, Firebolt, Flames, Frostbite, Ice Spike, Ice Storm, Lightning Bolt, or Sparks). Notes: The trap is triggered by proximity and will continue to fire as long as a target is within range. Removing or dislodging the soul gem from the stand disarms the trap. The simplest way to disable these traps is to quickly run up and grab the soul gem; grabbing it from behind is a better way to avoid damage, but is not always possible depending on how the trap is placed. It is possible to knock the soul gem out of its stand from a range using a spell, shout, or well-placed arrow, but the trap may not always be disabled if the gem is only knocked askew. The Telekinesis spell is very handy for dealing with these traps, you can use it to lift the soul gem completely off its stand. [verification needed — see talk page] It is also possible for one of these traps to dislodge its own soul gem. 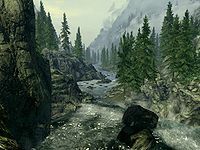 The traps in this section are part of the natural environment in Skyrim, and may be specific to certain locations. 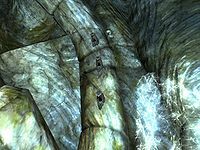 These dangers can often be avoided, and you may be able to reduce the damage taken from encountering them with racial abilities, enchantments, or potions. 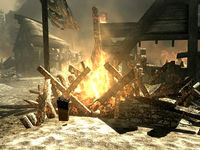 Description: Fires are generally seen in destroyed buildings, but also can be seen in more civilized locations, such as blacksmith's forges. Effect: Standing in fire causes fire damage. The type caused by traps is generally more dangerous. Notes: The hazard is passive and cannot be disabled. 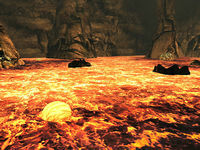 Description: A lake of molten rock surrounds the forge. Effect: Entering or touching the lava results in heavy fire damage and a lingering burning effect. Notes: The lava is always active and cannot be disabled. 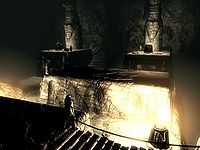 Lava in Skyrim is found only in the area surrounding the Aetherium Forge. Coming into contact with lava is dangerous; the moment you touch it, you will receive 150 pts of fire damage, and will be burned by an additional 15 pts of fire damage per second for four seconds. Description: Bolts of lightning crack down from the sky. Effect: If you happen to be struck by lightning, you will take shock damage. Notes: This hazard is passive and cannot be disabled. 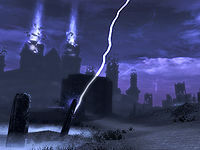 Random lightning strikes frequently occur while in the Soul Cairn. Generally, these are harmless unless they happen to strike you directly. Description: Watch for rapidly flowing sections of river, usually at the crests of waterfalls. Effect: When you are caught in rapids, the water pushes you in the direction of flow. Rapids do not damage you directly and are generally harmless, though it can make it difficult to find a slope to get back onto the shore. If you become swept up in rapids, you risk being washed over waterfalls, which may prove harmful or fatal depending on the height of the falls. 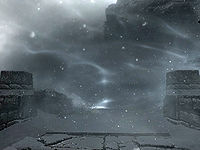 Description: Powerful swirls of wind and snow block your path. Effect: Standing in the wind causes severe frost damage. Notes: The Clear Skies shout will temporarily dispel the wind. Although Clear Skies will clear a path for you through the wind, it will return after a few seconds, so you'll need to move quickly and shout multiple times to traverse the path to the top of the mountain. It is possible to climb around the areas blocked by wind, but this can be difficult, and falling off the mountain could result in instant death. Even with a high level of frost resistance, the magical wind can kill you quickly. This page was last modified on 23 October 2018, at 12:15.